The revolutionary Series 200 Advanced range delivers a totally new fire detector platform that incorporates the new digital Series 200 Advanced Protocol. The new Protocol delivers more devices on the loop and gives greater control, reconfigurability and device management whilst enabling the overall system to be optimised to the location and use of the building with far greater flexibility than ever before. 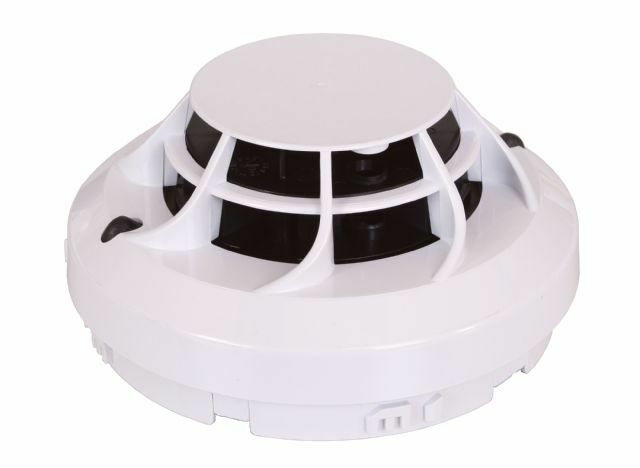 The multi-criteria multi-sensor 22051TE Photo Thermal fire detector uses thermal assistance to the core photoelectric smoke detector to give enhanced false alarm immunity and faster response to a wide range of incipient fires. The plug-in unit combines two separate sensing elements that are managed by embedded software to act as a single unit. The Fire Detector 22051TE conforms to EN54-5, a 58°C fixed temperature and rate of rise thermal, with the smoke detection element conforming to EN54-7. The thermal detection function combines thermistor technology with a software corrected linear temperature response. In areas where the normal daytime activities may potentially create unwanted alarms, the fire detector can be programmed to operate in a heat only mode, automatically reverting to full photo-thermal operation during unoccupied periods. The sensing elements of the fire detector 22051TE are panel controllable so the sensitivity thresholds of each element can be changed by the panel offering the ability to customise the device for the changing use of the area it is protecting. The fire detector 22051TE has two integral tri-colour LEDs that provide 360© local visual indication of the device status. The LEDs are programmable with static or blinking red, amber and green status indications available.